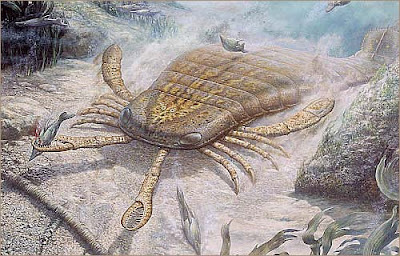 Scientists have discovered a fossilized claw of an ancient sea scorpion, which they estimate was more than eight feet long! It's the biggest specimen found so far, and according to the BBC, "the size of the beast suggests that spiders, insects, crabs and similar creatures were much larger in the past than previously thought." Noooooo! I, for the sake of all of us. Am going to post More than one word!